Though their conflict is ostensibly over the Justice Department’s production of sensitive documents to Congress, Democrats believe that the bureaucratic disagreement belies a more fundamental concern for the lawmakers: protecting Mr. Trump from the special counsel investigation, which Mr. Rosenstein oversees. He accused the Republicans of leaking their own draft articles of impeachment to reporters and said he would not comment on a document “no one has the courage to put their name on,” drawing a distinction from how the Justice Department prosecutes cases. Mr. Meadows fired back, accusing Mr. Rosenstein of stonewalling and calling on him to resign. “If he believes being asked to do his job is ‘extortion,’ then Rod Rosenstein should step aside and allow us to find a new deputy attorney general — preferably one who is interested in transparency,” Mr. Meadows, the chairman of the conservative Freedom Caucus, said in a statement. The draft impeachment articles are unlikely to advance through the House, where the Judiciary Committee and possibly the full chamber would have a say. But they represent the most explicit threat yet to Mr. Rosenstein by lawmakers with close ties to Mr. Trump. The lawmakers have been threatening to impose sanctions on or even impeach Mr. Rosenstein, 53, on and off for months as they have tangled over access to sensitive documents related to some of the F.B.I.’s most politically charged cases. Democrats have feared that Republicans would use any failure to comply as a pretext to fire the deputy attorney general. The rebuke from Mr. Rosenstein was at odds with his earlier actions. He has worked to meet the demands of lawmakers, recently letting them review an almost completely unredacted F.B.I. memo on the opening of a still-active investigation of the Trump campaign, a highly unusual step. Mr. Rosenstein also personally signed off on an F.B.I. raid of the home, office and hotel room of Michael D. Cohen, the president’s personal lawyer. In the days that followed, the president and his allies in Congress escalated their criticisms of Mr. Rosenstein, whose oversight of the Russia investigation gives him power to narrow the scope of the inquiry. Democrats fear that a new deputy attorney general could hobble the investigation without ending it, a move that could create havoc ahead of the midterm elections. 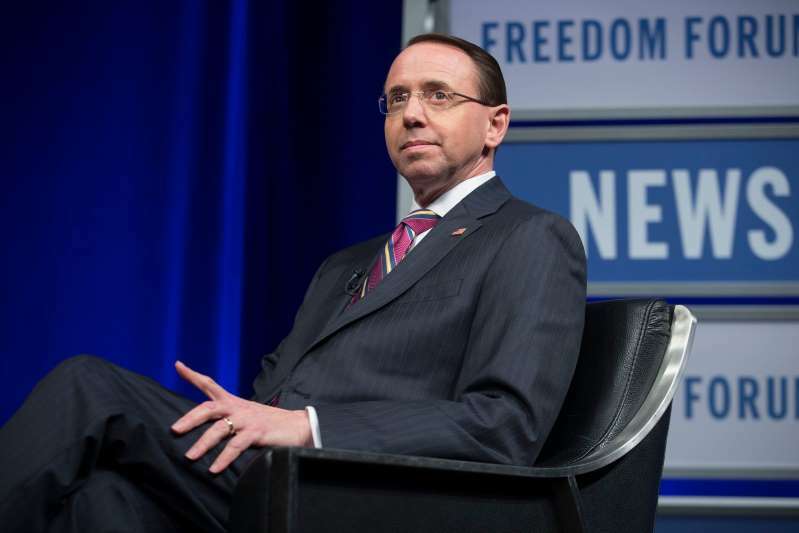 While he was critical of Republican lawmakers, Mr. Rosenstein was more flattering of Mr. Trump during Tuesday’s event at the Newseum in Washington honoring the Constitution and the rule of law. He said that there is no threat “to the rule of law in America today” because it is protected by the Constitution. He also fought back against accusations that Mr. Trump’s continued assailing of law enforcement officials has undermined the Justice Department’s traditional independence from political interference. Noting that the department is “not independent of the executive branch,” he said its mission was to enforce the law as well as carry out the priorities of the administration, and that the two were not in conflict. Mr. Rosenstein sometimes spoke with the emphasis of a prosecutor giving closing arguments before a jury. At times he drew a copy of the Constitution from his breast pocket and brandished it to make a point. But he also held forth on less weighty matters, including pronunciation of his own last name, an occasional topic of lighthearted debate in Washington. Follow Nicholas Fandos on Twitter: @npfandos.